Can I put a video in an email without sending it as an attachment? But you can do it. Or at least the recipient of your email will think you did (unless they know this simple trick). Either way: you’re getting the video to your recipient, and you’re not having to send them a big attachment. Shoot your video. I was traveling without any gear, so I just used my smartphone to shoot this video. Upload your video to a hosting platform like YouTube or Vimeo. In my case, I was able to use the YouTube app for Android. It even allowed me to trim off the beginning where I was getting the shot angled correctly and wasn’t yet looking into the camera. 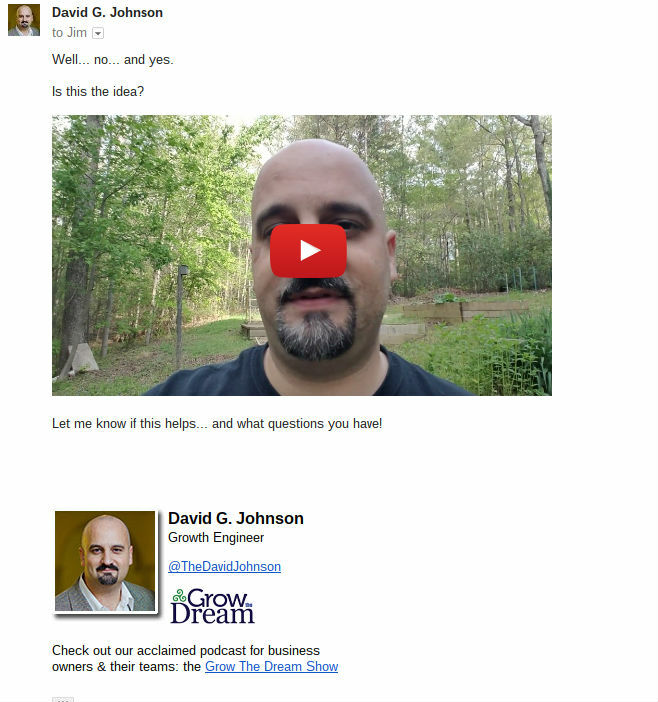 Embed that video in a blog post or a page on your website. Since I’m a WordPress user, this was really super simple. All I needed was the URL for the YouTube clip, which I copied & pasted into my blog post. Take a screenshot of your video. I was traveling with my Chromebook, so I literally just played the video back in full screen mode and used the keyboard shortcut to screenshot the video. Insert the screenshot in your email. Whether you’re sending an email to one person with a tool like Gmail or Outlook, or sending bulk email to your subscribers via a system like Aweber, MailChimp or Infusionsoft, you want to just place the image in the body of your email.Pro tip: If you have access to photo editing software, add a “play” button to the image. You can use fancy tools like Photoshop, a web-based editor like Pixlr (that’s what I used since I was on my Chromebook), or even simple smartphone apps or basic tools that may have come with your computer. Link the image to the blog post you created. Every major email tool will allow you to link your image to any URL you specify. So just get the URL of the blog post (or page) you embedded your video into, and use that as the target for your link. The end result is that when the recipient of your email opens the message, they see your image. When they click it, their web browser opens to the page on your site where the video is located, and they can click the video to play it. If you have the “play” button overlaid on top of the image, then clicking your image will be very intuitive. If you don’t have a “play” button on the image itself, then you’ll want to add some language to your email to let people know they can click the image to view a video. Don’t have a website? No problem (for this purpose, anyway! )… simply point the link directly to the YouTube or Vimeo URL for your video.